Registration deadline: Thursday 7 April 2016. Sketches deadline: Thursday 21 April 2016. 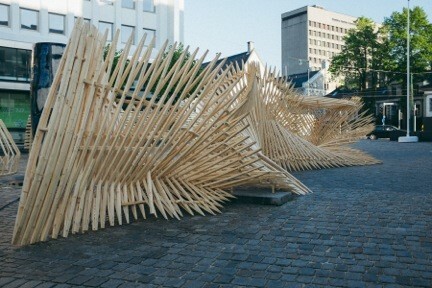 Bergen International Wood Festival (BIWF) focuses on the use of wood as a material, and on its constructive, structural and tactile qualities. 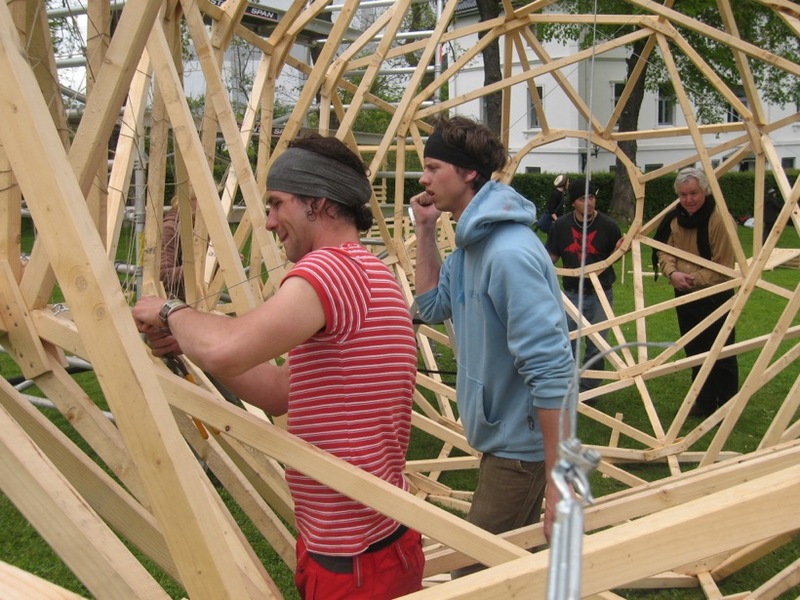 As part of the programme, we hold a biannual competition in the construction of experimental spatial structures in wood. Designers, architects, artists, craftsmen and students from all over the world are hereby invited to take part in a competition in Bergen in May 2016. The participants will join teams of three persons. The invitation will be distributed both nationally and internationally to institutions in the fields of design, architecture and fine art. In addition to the competition, the programme also has a social and cultural dimension. We also want participants you to get to know Bergen and its surroundings. This is the sixth consecutive festival, and so far we have had participants from 32 different countries. This year, as before, there will be 24 teams taking part. BIWF covers food and accommodation for participants, and, if necessary, local transportation in Bergen. The participants must cover travel expenses to/from Bergen. has a parklike feel, with walkways, vegetation, open areas and the waterside area, which can be utilised by the participants. The general public will have normal access to the area – something that participants will have to take into account as regards keeping the site tidy and safe, and by being accommodating towards curious onlookers. This year’s theme is ’the Green Transition’. The festival will focus on the unique properties of wood, and its sustainability as a renewable resource. The event will include a conference 12 May and lectures to which the participants, experts and the business community are invited. 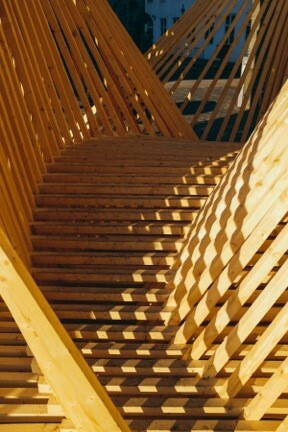 The participants are urged to challenge wood constructively, structurally and in terms of form. 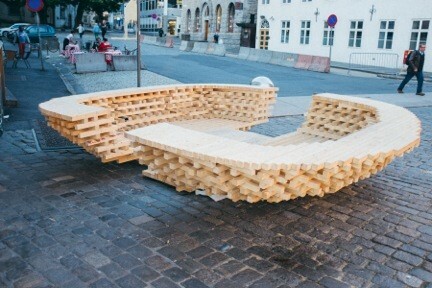 The festival is intended to inspire people, developers and the business community to use wood more. Each team will be assigned an area in which they can build. Individual wishes will be taken into consideration and efforts will be made to ensure that the structures that are built are given a good location. Height and length are unlimited, but stability must be documented before permission to build is granted. The structures must be free-standing, they cannot be fixed to the ground. The teams work within a limited time period every day, and materials will be delivered to the construction site. The works will be assessed by an international jury. The teams must prepare a concept, model and sketches or similar for their project and submit their proposals to the organising committee (see below) with specifications of what materials are needed. It will to some extent be possible to make other dimensions available if the participants so wish. Special details, such as bolts and levers etc., must be provided by the teams. Standard connectors like nails and screws will be available. The teams must bring their own hand tools. Base stations will be established with technical equipment such as crosscut saws and circular saws, as well as power outlets from which power can be run to the work sites. The completed structures are the property of the City of Bergen. The works will remain on the site for four weeks. Some of the structures will then be reinforced, if necessary, positioned and lit, so that they can remain on display until next summer. During the previous five festivals, Bergen International Wood Festival exhibition has proved to be a great success.